The Inspiration Vision is a Buddy Inspiration (Inspiration Classic) with changed electronics. The separate handsets of the Inspiration Classic (at that time it was named the Buddy Inspiration…) had been moulded into one handset. So: the old “master” and “slave” are now one physical device. A HUD was added (with optical fiber). And also a new item: the temp stick. This “temp stick” (or: CO2 scrubber monitor) was patented by Ambient Pressure Diving and is now used by other CCR’s (Sentinel, rEvo,…)(see under “safety” for an explanation). The head and canister were changed, since the new electronics had to be added. The overall verdict is 4 stars. Compared to the Classic it lost 1 one start on “ease of set-up” but gained 1 star on “safety” (because of the temp stick an the HUD). The price is very competitive when one takes all the options and functionality into account. However it lost 1 star, because it is more expensive then the Classic. I guess that the Vision is the unit that has the most sales of all CCR’s. It surely has a mature state. Many CCR’s are build in garages or workshops and low quantities. The Inspiration is in many ways the reference of new CCR builders. However sales have decreased lately. I think this has to do with the fact that there are (too?) many CCR’s on the market nowadays. 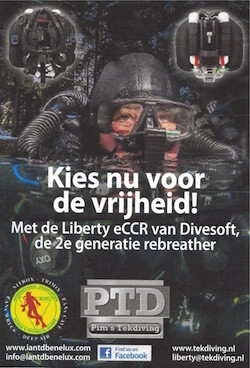 And also that (experienced) CCR divers want different unit. It is easy to start up the unit. Calibration is fully automatic. The unit calibrates on oxygen. The displays have also an integrated trimix computer and display for the temp stick. That makes it a bit more complicated then the Classic. However, the manipulation of the basic functionality is still the same as the Classic. Using the functionality is very intuitive. The displays are now LCD. I guess in the future they will also have OLED available. Trim is good, when the top weights are in place. The lungs are over the shoulder. The diver has a tendency to be vertical. But shifting and placing weights in the good places, makes it easier to keep a horizontal position. The WOB is good. Mostly due to the placement of the lungs. I guess that the breathing hose could be wider and of a stronger/better quality. The housing/case makes it somewhat difficult to put in a bag. However the head with the handsets can be easily removed and put in the hand luggage. Tanks are widely available with CCR friendly dive resorts and charters. Safety is good. An APD Autoair (a second stage integrated with the inflator of the BCD) is standard. Most technical divers remove the Autoair, because the 3 ltr onboard is not enough to make an ascent (with deco). However it could be used for sanity breaths. It is difficult to give the Autoair to a buddy. The Autoair can never replace bailout (after 18 mtrs). The unit doesn’t turn on automatically. If the diver forgets to turn on the unit he/she will get hypoxic and die. The unit not being turned on by the diver caused several fatalities. A safety increasing device is the temp stick. It is used to check the working of the scrubber. Because the scrubber turns warm when in use, it turns cold again when it is not effective anymore. One can tell from the heat of the scrubber if its working or not. The gas flows from the bottom to the top of the canister. The lower part turns warm and the top part stays cold. As soon as the lower part doesn’t work anymore, the top part starts to work and turns warm. This process is visualized on the handset. APD patented this successful idea. APD added also a HUD to the Vision. The information is transported with optical fiber. The lights of the computer for the HUD are in the head of the canister. The Inspiration Vision has a very competitive price. Spare parts are quickly available with the manufacturer and the distributors. Many dive stores sell parts (on line). Also (CCR friendly) dive resorts often have spare parts on stock. APD also has one of the best websites for their units (downloads, video’s, maintenance, etc.). Sofar: the best after sales of CCR’s in the market. The housing is good. A lot of plastic. The breathing hose “feels” soft. The unit is CE rated until 100 mtrs. At 140 mtrs the buzzer (for the audible alarms) tends to implode. When the buzzer is removed, one could dive the unit deeper.